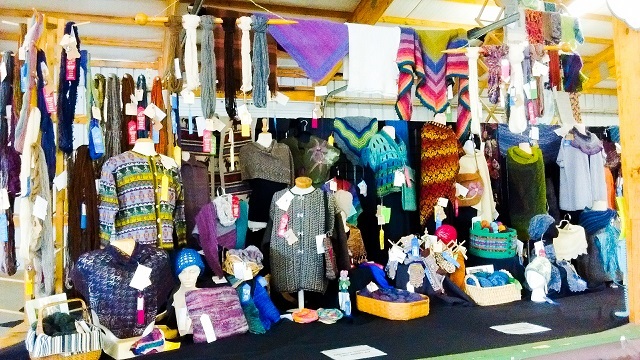 The Skein & Garment Competition allows competitors to put their work before knowledgeable judges so they may receive feedback and continue to grow as fiber artists. Our judges have great technical knowledge and are happy to provide feedback on each item entered for judging. All items are displayed during the festival as a way to show the public the variety of ways fiber may be used. Spinning since 1982, Debbie Santolla has been teaching and giving workshops to both groups and private students. As part of the learning process, her novice students are encouraged to enter their work at Maryland Sheep & Wool, FLFF, New York Sheep & Wool and local fairs. Debbie uses this process as a teaching tool and many of her students receive awards often for Best Novice Spinner. Debbie has studied with many noted spinning and tapestry artists and uses her handspun in this work. She looks forward to the opportunity of using her experience as a teacher as the 2019 skein judge. Tina Turner is the proud owner of The Knitting Circle, www.tinaturnerknits.com. She has been knitting for over 35 years, and in 2002 became a Craft Yarn Council Certified Knitting Instructor. Tina has taught at the Finger Lakes Fiber Festival, the Yarn Boutique in Rochester NY, the Pittsford and Fairport libraries and at The Knitting Circle. She has been President of the Rochester Knitting Guild and also of the Genesee Valley Handspinners Guild. Teaching knitting has become a passion and a joy. Tina has started to do more designing and has patterns available on her ravelry site. The fleece sale provides opportunities for both festival attendees and fiber producers to buy and sell a wide variety of fleeces in one convenient location. This document will provide all the information you need to shop at the festival!